On this overly elegant ukulele I ‘went all out’ combining a mixture of art - deco cues highlighted with a fretboard inlay of a Phoenician Flapper Girl. 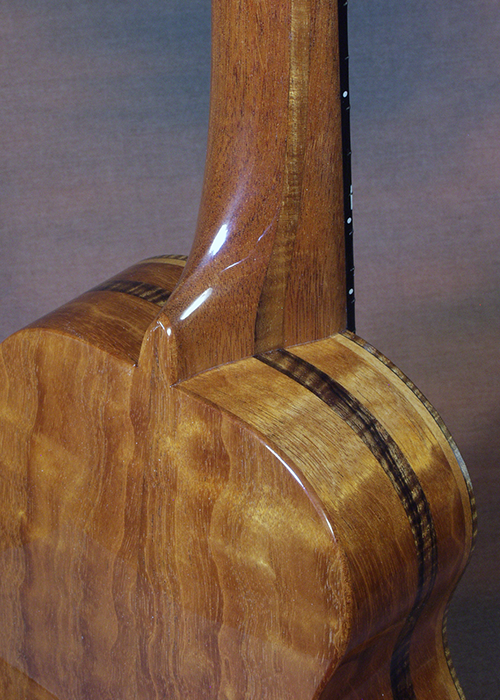 The backside of the peghead is capped in a dark koa, dark koa stripes run down the neck and a dark koa stripe inlaid around the perimeter of the instrument which is quilted Honduran Mahogany. The soundboard is Western Red Cedar giving the ukulele a warm tone. The Flapper Girl inlay is composed of Gold Mother of Pearl, Ivory (from old piano keys), Koa, a spot of Turquoise and the fingerboard is ebony. I think that this perhaps is the most elegant instrument I have made yet. A lot of time went into the design and execution of this special ukulele. And as is to be expected of a Pohaku ukulele, it plays even better than it looks. Not a detail was missed!